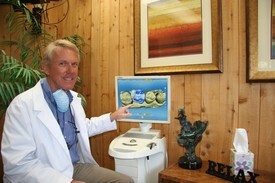 The picture above shows me at our computer aided design machine, CEREC. This allows me to design and fabricate high quality porcelain crowns in one appointment. This means no temporary crown to come off and no second appointment. This is truly amazing technology! 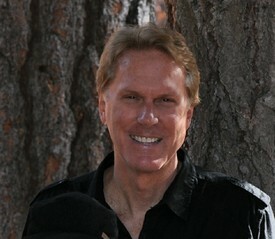 Dr. David F Andrews, D.D.S. I have been in practice since 1976 and have had the pleasure of having many wonderful patients over the years. I take great pride in making each patient comfortable upon every visit. That is the reason I use products like Onset in my office. Onset makes each anesthetic injection painless. The reason anesthetic injections are painful is local anesthetics contain hydrochloric acid which is used as a preservative. The hydrochloric acid is what causes the anesthetic injection to have that “bee sting” feeling. Onset buffers the hydrochloric acid (gets rid of it) which results in a pain free dental injection. All my patients love onset!!! I have been told over the years by many patient that I have a relaxed nature which is very calming to my patients. Our office places a high priority on each patients comfort and well being. Thanks for taking the time to read this. We would love the opportunity to have you as a patient. Hi, I am Dr. David Andrews. I would like to tell you a little about myself. I grew up in Atherton, California. I went to Menlo-Atherton High School, received a B.S. degree from the University of California at Davis and my D.D.S. degree from U.O.P. School of Dentistry in San Francisco. Often I am asked the question, why did I go into dentistry. For me this is an easy question. I have always been good with my hands and enjoyed working with them. I grew up tinkering with everything from building kit stereo electronic equipment to rebuilding my car’s engine. I have always loved the sciences, enjoyed learning and wanted my own business. My neighbor was a Dentist when I was growing up and introduced me to Dentistry. For these reasons I knew I wanted to be a dentist in high school and set my sight on it. 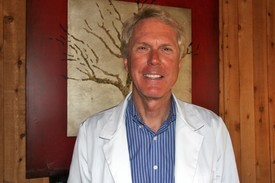 I graduated from dental school in 1976 and have been in private practice since then. I practiced in Cupertino, California for 31 years and moved to Tahoe in 2008 where I started my practice in Carnelian Bay. I love Tahoe and all it has to offer. I love to ski, hike, mountain bike and boat on Lake Tahoe just to name a few of my interests. I am so grateful to be living here in Tahoe and have the practice that I have in Carnelian Bay. I really appreciate my wonderful staff and fantastic patients. Thanks for reading this biography. I am looking forward to meeting you.